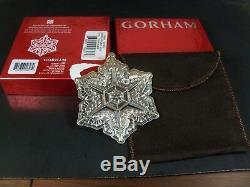 BEAUTIFUL RARE 2011 GORHAM STERLING SILVER SNOWFLAKE IN EXCELLENT LIKE NEW CONDITION. IT IS THE 42nd IN THE SERIES THE 2011 MEASURE 3 1/2 IN DIAMETER AND WEIGHTS 23.45. GRAMS TOTAL AND IS 2 SIDED. IT COMES WITH THE ORIGINAL GORHAM BOX AND POUCH. NO CARD MARKED ON BACK OF BOX. BOX HAS AN AREA ON THE BOTTOM WHERE IT LOOKS LIKE A STICKER WAS TAKEN OFF. 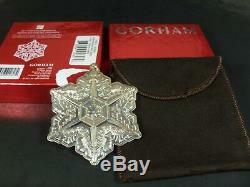 The item "Rare Gorham 2011 Sterling Silver Snowflake Christmas Ornament" is in sale since Sunday, March 3, 2019. This item is in the category "Collectibles\Holiday & Seasonal\Christmas\ Modern (1946-90)\Ornaments\Metal". The seller is "hopesattic-us" and is located in Mosier, Oregon. This item can be shipped to United States.